No matter how strongly it is advertised about the convenience of nonstick cookware and how convenient you are in using these, there are several reasons why the experts warn about these. They will even go a step further and suggest you to throw away the conventional ‘non-stick’ cookware and use others instead. There is always something in the environment that will work against you even after putting in your best efforts to maintain a healthy and wholesome lifestyle. Human modernity is constantly drifted towards convenience and unknowingly has resulted in the heavy burden of toxic compounds in the body languishing it further. It is found in all aspects and more so from the cookware that you usually come across in almost all twenty-first century households. 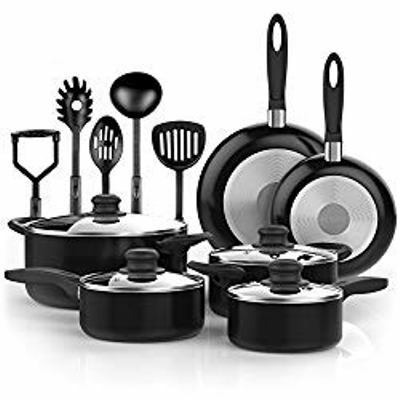 · The average cost of non-stick cookware is very low. Well, you may be inspired by this set of benefits of non-stick cookware but you may not be aware of the inconvenient truth of it. · PTFE contains fluropolymers such as Poly Tetra FluoroEtheylene along with polyfluoroalkyl and its compounds. All these materials on the surface are extremely toxic. These are also highly resilient when it comes to interaction with your body as well as the wider environment. · The fluorinated chemicals contained in these substances provides the slippery surface but when these are exposed to heat these become a potential source for perfluorooctanoic acid or PFOA. This is a long-chain chemical compound that results in serious health issues such as thyroid disease, organ damage, infertility in women, and reproductive and developmental issues. More interestingly, the Environmental Protection Agency has declared perfluorinated compounds or PFCs as carcinogens but still these chemicals are widely used in an array of household items. According to a study conducted by Centers for Disease Control and Prevention it is found that in America along 98% of the people have traces of PFCs and PFAs in their bodies.